EPBOT: You Guys, We're In A Book!! I've been lucky enough to be a part of some amazing things over the past four years, but one of the things I'm most proud of is helping break the story of Katie, the little girl being teased at school for her Star Wars water bottle. You Epbot readers took Katie's story - which had 18 comments on it when I first mentioned it - and made it go viral within hours, leading to a massive, 'net-wide movement to encourage this one girl (and everyone like her) to never be ashamed of the things she loves. It was beautiful, and awe-inspiring, and something I'll never forget for as long as I live. Out of that experience Katie's mom, Carrie, has now written a book - and get this: you guys are in it! Carrie talks about the massive influx of Epbot readers who rushed to her blog to encourage Katie, and she even includes a few of your comments! Then she thanks us all in the acknowledgements. So, so cool. 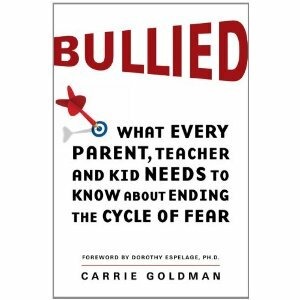 I think the title is pretty self-explanatory, so if you or someone you know works with kids, has kids, or is otherwise interested in learning more about bullying and how to prevent it, definitely check out this book. You can also visit Team Bullied, the new site Carrie's put together for people to share stories and advice alike. It's a great place to join the conversation and learn more. A huge thank you again to Carrie and Katie for continuing to be such inspirations, and for letting us all be a part of Katie's story. May the force continue to be with you, ladies - I'm sending virtual bear hugs & warm fuzzies your way! Awesome! I just sent the link to the person who orders our adult books! That is awesome, and I wish this book had existed when I was a kid. That is awesome. Thanks, Jen, for reaching out to Katie and sharing her story with us. Way to go Katie's mom. I'll definitely be picking up a copy of that book. This make me smile super big! Happy thoughts to little Katie and her family from us in Michigan. I am almost 50, but was in high school in the late 1970s. Everyone had pictures in side their locker. Mine, however, were nature shots cut from National Geographic Magazine. I was teased for THAT! "You're weird." My reply? A big smile and "THANKS!" Even if my comment to Katie is not in the book, I am very proud to be a small part of this. Good job Epbot readers! I told my sister to come and have a look at Epbot. She's sixteen and a wee bit of a geek. She does get grief at school for it, but I could not be more proud! She loves Kingdom Hearts, sings Disney at the top of her voice, writes fanfics about the Marauders from Harry Potter and we're planning to come over to the states to attend a convention together once I've managed to raise some funds (and yes, we will totally be doing fabulous cosplays!). I'm excited that she'll come over here and see what amazing people geeks can be (girls and guys!). Thank you Jen, thank you Katie, and thank you Epboteers! The next time someone gets nasty in the comments because: it's not a King Cake; or the fact that you published "A" must mean you support "B" and are thus a horrible person; or you're too geeky, or not geeky enough; or it's National Ambidexterous Lizard Day and you didn't post a single cake about lizards and what-is-your-problem?, you can remember Katie and her Mom and know that, when everybody else sits back and whines, you did something real and positive, and it made a difference in the world. Bravo. Ah! Getting a little teary again, just thinking about how much Katie's story reminded me of my own childhood experience, and also how much it inspired me to keep being my own person, even when the pressure is on to conform! Go Katie! Go Geek Girls! Go Everyone!